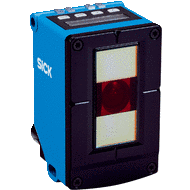 Optical line guidance sensors detect luminescent adhesive tape for marking lanes regardless of the background, contamination or surface defects and reliably output the deviation to the control. Creating and changing lines is easy and economical. In addition, the sensors read 1D codes while driving and transmit route information and drive commands.